The ss Great Britain Trust has succeeded in its bid for a £176,000 Stage 1 Lottery grant for the development of a new £7million museum dedicated to the life and works of Isambard Kingdom Brunel. The ‘Being Brunel’ project will explore the man and his remarkable works, many of which have added much to the heritage of Bristol. It will make a major collection of Brunel material publically accessible for the first time, including diaries, personal possessions, drawings and plans. Highlights will include including his ‘locked’ diary, his cigar case and his original plans for the Clifton Suspension Bridge. 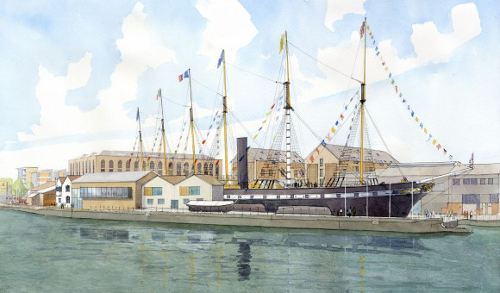 The proposed site for ‘Being Brunel’ includes the buildings along the starboard side of the ss Great Britain, in particular the Grade II*-listed 1840 drawing office of the GWSSC; known as the Brunel Drawing Office. The redevelopment of the adjacent, semi-derelict, 1940s buildings as a museum gallery will complete the recreation of the historic setting of the Great Western Dockyard around the ship, while also providing access for disabled visitors. It is intended to recreate the mass, scale and atmosphere of these historical buildings; creating a sense of dockland ambience and industrial character in keeping with the rest of the dockyard. The Lottery grant will enable the Trust to develop the project proposal and submit a round two application which, if successful, should allow ‘Being Brunel’ to open to the public in 2016.